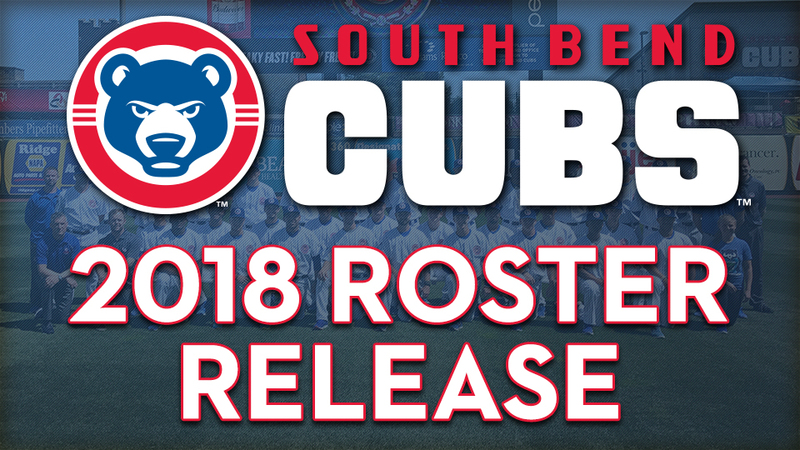 SOUTH BEND, IN - The South Bend Cubs, in conjunction with the Chicago Cubs, have announced their 2018 Opening Day roster. The team is compiled of 27 players featuring 14 pitchers, three catchers, six infielders, and four outfielders. Jimmy Gonzalez is back for his fourth season as the manager in South Bend and fifth in the Cubs organization. Last season, Gonzalez led South Bend to a 75-64 record and an overall finish at third place in the Midwest League standings. Pitching Coach Brian Lawrence enters his fifth season in the Cubs organization and third with South Bend. Hitting Coach Ricardo Medina returns to South Bend after spending 2016 with the team and 2017 with Double-A Tennessee. Finally, Coach Paul McAnulty enters his first season with the Cubs organization after spending last season within the Los Angeles Angels organization. High profile pitchers headline the South Bend Cubs roster this season. One time number one overall prospect and current number three overall prospect Jose Albertos comes in as the highest rated player in 2018 for South Bend. Albertos, a 19-year-old right hander from Mexico, spent last season with the Eugene Emeralds. He is joined by left hander Brendon Little. Little, the Chicago Cubs number one overall pick in the 2017 MLB Draft enters his second pro season after also spending time last season with Eugene. Little is currently rated as the number six overall prospect in the Cubs organization. Other top pitching prospects coming to South Bend include Cory Abbott (2nd round, 2017), Javier Assad (NDFA, 2015), and Erich Uelman (4th round, 2017). South Bend will have a new look this year in the field, as only infielder Yeiler Peguero and outfielder Zach Davis saw time with South Bend last season. New to the infield this season will be Austin Filiere, a third baseman who was drafted by the Cubs in the 8th round of the 2017 Draft. Filiere hit six home runs and drove in 25 RBI with Eugene last season. Three new outfielders join the South Bend Cubs in 2018, all of them coming from Eugene. 2017 19th round selection of the Cubs Chris Singleton will debut with South Bend for the first full season action of his career. In 27 games with Eugene last season, Singleton drove in 10 RBI and added six stolen bases. Two of the three catchers assigned to South Bend in 2018 have played at Four Winds Field before. Michael Cruz and Tyler Payne both spent time behind the plate last season for South Bend. They both return to the fold alongside 19-year-old Miguel Amaya. Amaya is ranked as the Chicago Cubs number 11 overall prospect. The roster released is only a preliminary roster and subject to change. The Cubs will welcome the University of Notre Dame to Four Winds Field for a 7-inning exhibition game on Wednesday, April 4. South Bend will then travel to Comstock Park, Michigan on Thursday to face Eastern Division rival West Michigan to start the 2018 season. Opening Day at Four Winds Field is Saturday, April 7.